I’m thrilled today to introduce you to author Michael E. Burge with his debut novel Bryant’s Gap. Keep reading for an excerpt and enter our giveaway for a chance to win a signed copy of the book! In 1947 postwar Chicago, mob related violence is commonplace. Nothing stands in the way of the “Outfit” when it comes to making money; a body here or there, who really cares as long as everyone’s pockets are lined, but when a man is found dead in a small Illinois town—people take notice. Bargetown’s Chief of Police Bert Thatcher looks to a seasoned and astute railroad detective, Grady Colston, for help in solving the case. Fate has brought them together, but they soon realize just how much they have in common. A tight bond develops between the two men as they strive to uncover the identity of the man found dead on the railroad tracks—his right arm severed. As the investigation unfolds, surprising details of the man’s past come to light, and the circumstances of his death pose a major dilemma for Grady and Bert. From the banks of the Wabash River to a beach in the South Pacific, BRYANT’S GAP is peppered with folksy humor and nostalgic references that whisk the reader away to a simpler time—when good and evil stood on opposite sides of the street and relationships had real meaning. “I imagine this is becoming a problem across the whole country at this point,” Bert said, and took a swig of beer. Meticulously researched, Bryant’s Gap is chock full of Chicago area history, beautiful descriptions of the surrounding countryside and fictionalized versions of stories based on actual events in the past. See the photo below? This photo is the real deal, but there is a story told in Bryant’s Gap that is inspired by the true story behind this photo and it helps add character and shape part of the narrative. 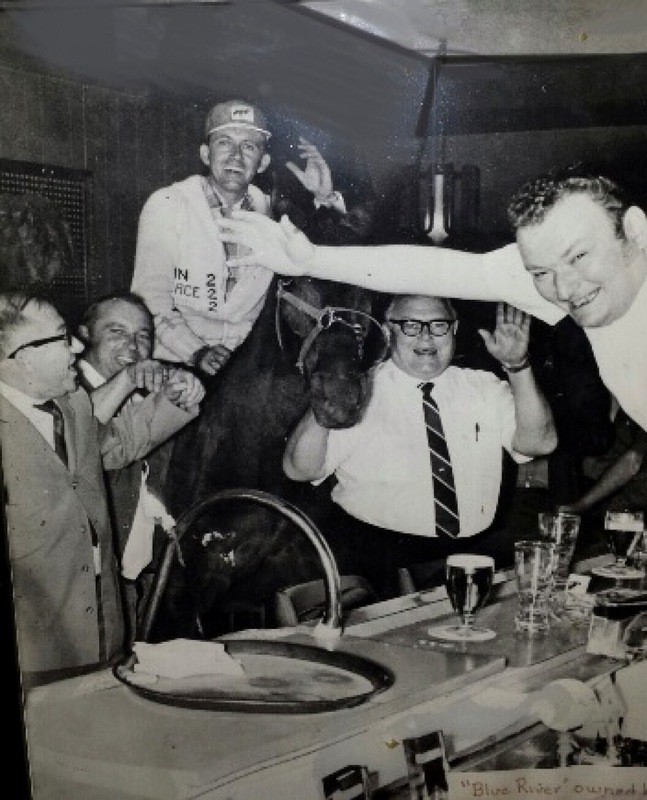 You can’t tell me you don’t want to know the story behind this Thoroughbred racehorse in a bar! I was as enchanted with the characters as I was engrossed in the unfolding murder mystery. The investigation had plenty of twists and turns, resulting in a tough moral dilemma for Bert and Grady. If ever there was a “feel good murder mystery”, then this is it! You’ll find yourself smiling throughout the story as you get to know Bert and Grady and their supporting cast, but also hanging on every twist in the murder investigation. A perfect blend of murder, Chicago mob history and likeable characters will make Bryant’s Gap one of your favorite reads of the summer! 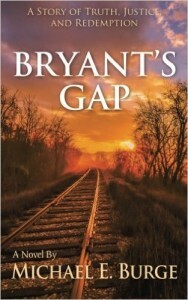 I have a SIGNED copy of Bryant’s Gap to Giveaway! You can enter here once every day! Contest is open July 28 – August 4, 2015. Winner will be chosen by random drawing. Because this is a print copy, winner will be asked for a USA mailing address. 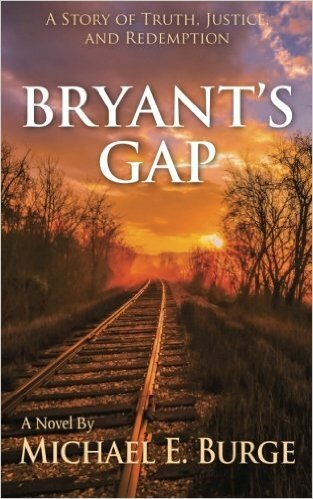 Michael E. Burge learned to play piano in his forties, golf in his fifties, and now recently retired from a career in marketing, has gone on to publish his first novel- Bryant’s Gap. Set in 1947, the story is peppered with childhood memories of the locations where he grew up; a small town on the Wabash River and the suburbs of Chicago. I hope you enjoy Bryant’s Gap as much as I did, please come back and share your thoughts with me in the comments! I’m from Chicago so I think this would be interesting to read. thanks!